Porches create a practical and stylish entrance to your house and will help to differentiate your home from the others in the vicinity, especially if it is complemented with a new driveway. Also, whilst porches will protect you from bad weather when you arrive home it will also provide extra space which comes in handy for the storage of boots and brollies or just to hang your coats. 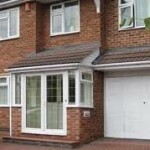 The replacement window and replacement door systems described elsewhere in this website can be used to build porches from either PVCu or hardwood double glazed windows and doors. Porch roofs can be constructed traditionally with timber roof rafters and a plaster board & plaster skim finish to form the internal ceiling. Or alternatively, porches can be fitted with GRP (Glass Reinforced Polyester) moulded roofs, some of which resemble real tiles or leaded roofs, or porches can be constructed with a roof similar to conservatories, fitted with either polycarbonate or glass. 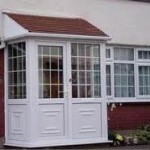 Building work for porches is constructed to a similar specification for conservatory and orangery bases. 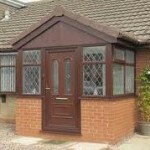 The walls to your porch can be a combination of brickwork and either solid PVCu or glazed panels as would be fitted in PVCu doors and side panels. 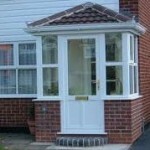 Much of the information on the various pages of this website which deal with PVCu and timber windows, doors and conservatories also relates to porches. Because of that we have restricted the information on this page to any differences we think you should be aware of in respect of general advice, planning permission and Building Regulations. 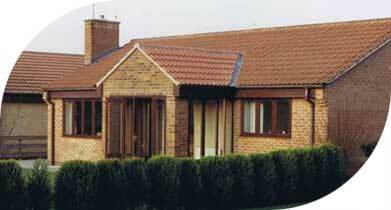 • The external ground floor area of your proposed porch would not exceed three square metres. 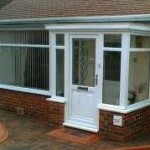 • No part of your porch, including the roof, would be more than three metres above ground level. 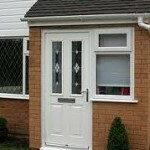 • No part of your porch would be within two metres of any boundary to your home. • There must be an external quality front entrance door between the main house and the new porch area – either the existing door or a new one. • The house must have a ramped or level access for disabled use and the porch structure must not adversely affect overall access to the house. This information on porches is provided for your guidance only. The rules relating to Planning Permission and Building Regulations are constantly changing and you should check with your local planning authority or building control department for clarification regarding your individual situation.